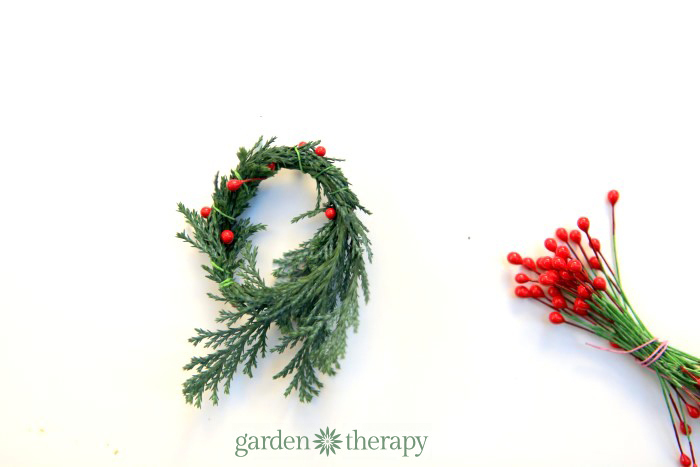 With just a snippet from an outdoor evergreen you’re well on your way to making these miniature wreath ornaments. 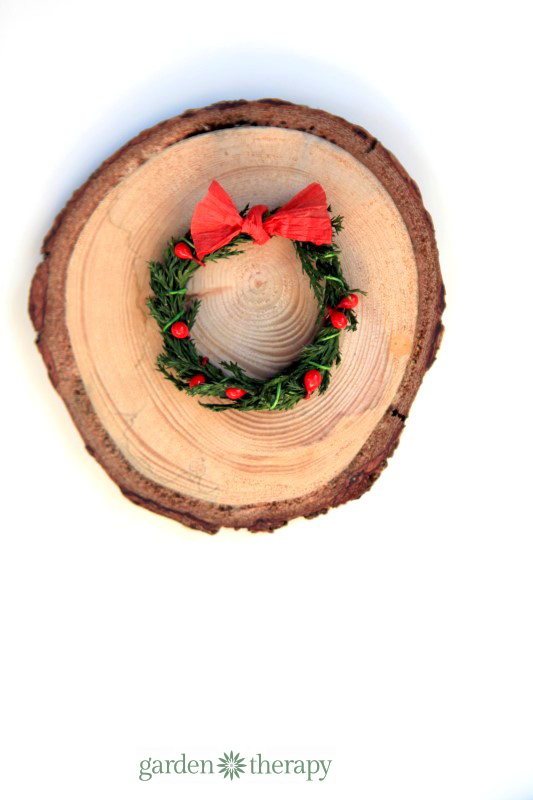 You can hang them on the tree, use them to decorate the outdoors, add them to gifts, or even use them as napkin rings! No matter how you use them they are a fun and simple project to bring the outdoors in. I don’t really know why, but this holiday season I’ve been making everything in miniature. It started with these tabletop Grinch trees, a smaller version of the 9-foot Grinch tree I decorated previously. Then the tree got even smaller with a teeny-tiny, mushroom-decorated, outdoor, Christmas tree for the gnomes, who I also made in miniature. And now miniature evergreen wreaths. 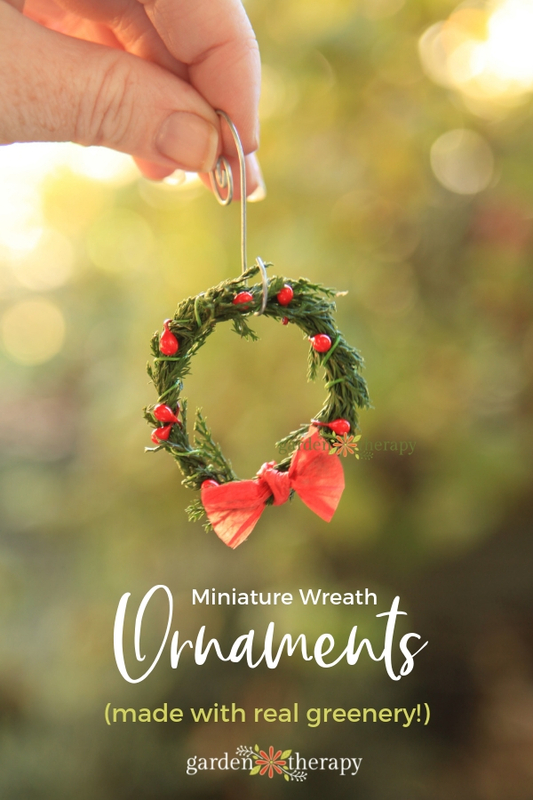 Janit Calvo, the queen of all things miniature has an in-depth tutorial for making miniature wreaths and many ways to embellish them over on her blog. Please head over there to see her many ideas. The idea for mine came from finding this floral wire with red berries on the ends. 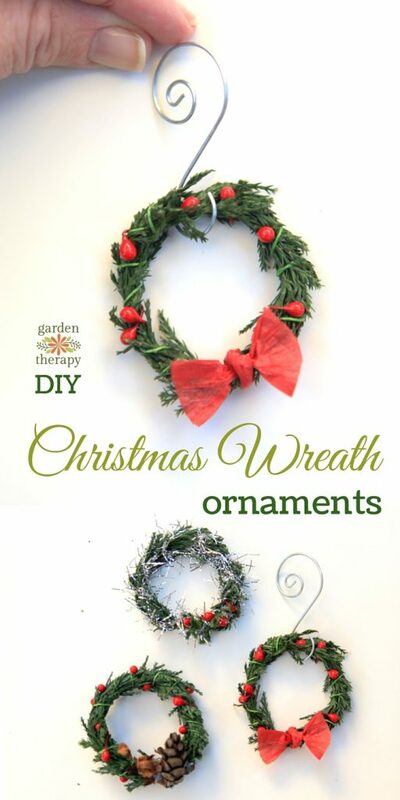 I thought it would be a quick and easy way to make plenty of decorations from garden clippings. 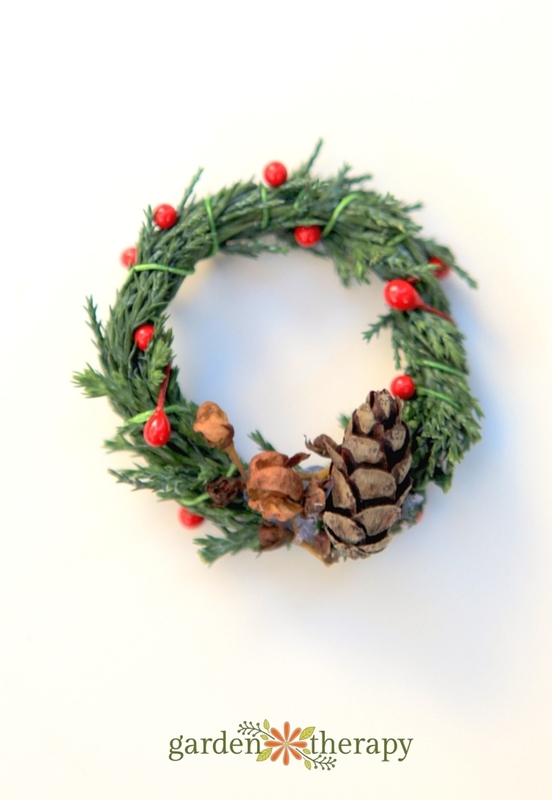 Miniature decorations: ribbon, pinecones, seed heads, holly. 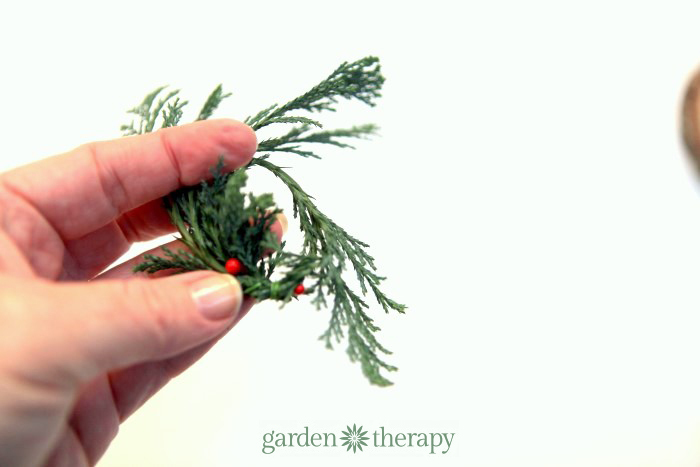 Start with a fairly pliable clipping from an evergreen. Leaves from cedar and false cypress are soft and easy to form. Bend the clipping around so that the tip overlaps the cut end. Wind floral wire tipped with red berries around the two ends to secure it. 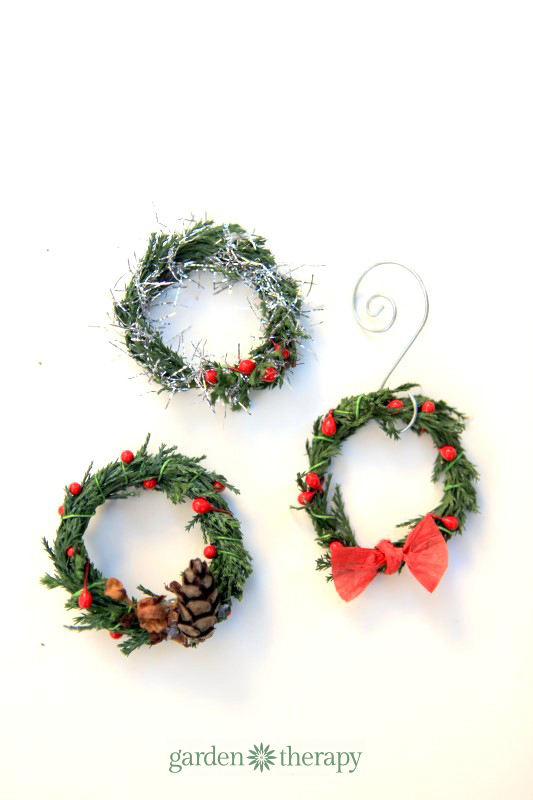 Continue wrapping wire around the wreath until you have all the little leaves tucked in. 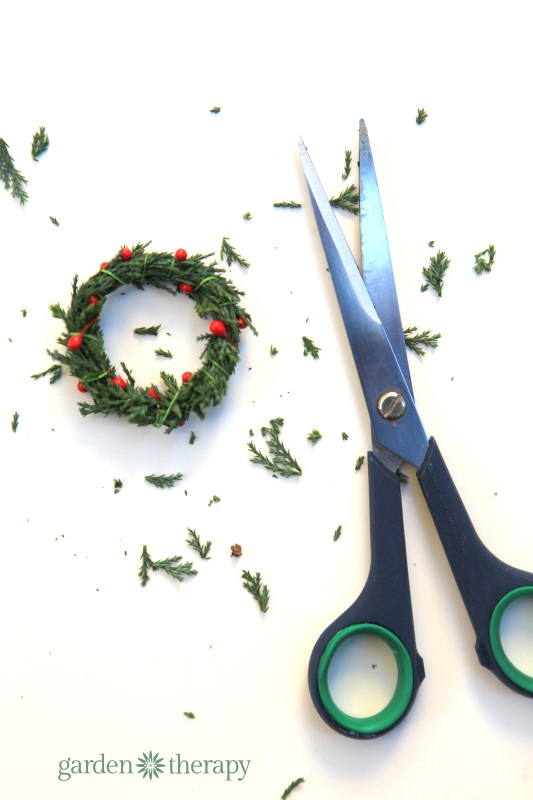 Trim the wreath with scissors to clean it up and make a nice round form. 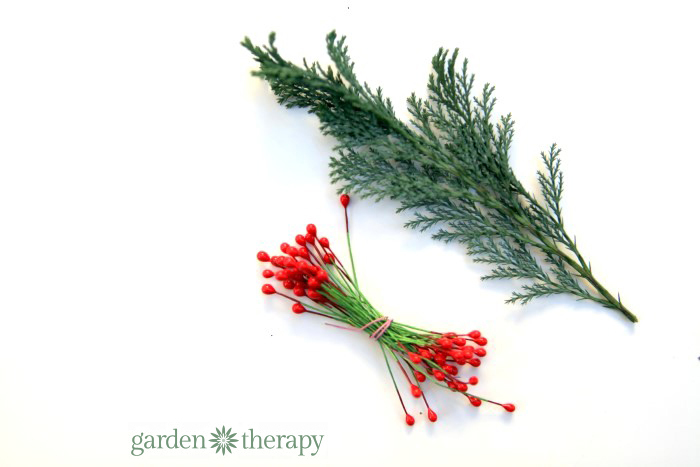 Add decorative elements like seed heads, miniature pinecones, and other things found around the garden with a hot glue gun. You can also use ribbon to decorate the wreath. This raffia ribbon makes an easy bow as you simply need to tie it in a knot, then unfold the ends of the ribbon. 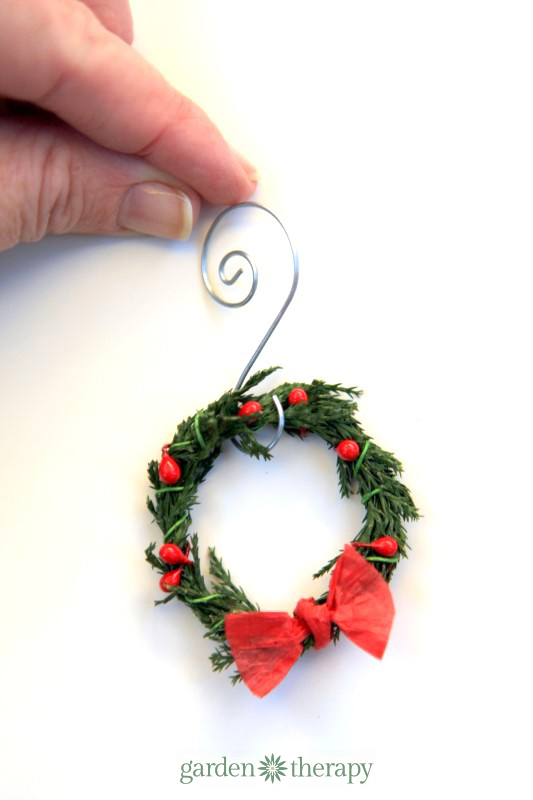 You can also find ribbon that looks like tinsel, which I wound around another miniature wreath. Add ornament hooks to hang them on the Christmas tree or around the garden. Or tie them to gift wrapping and add a little outdoors to your presents. 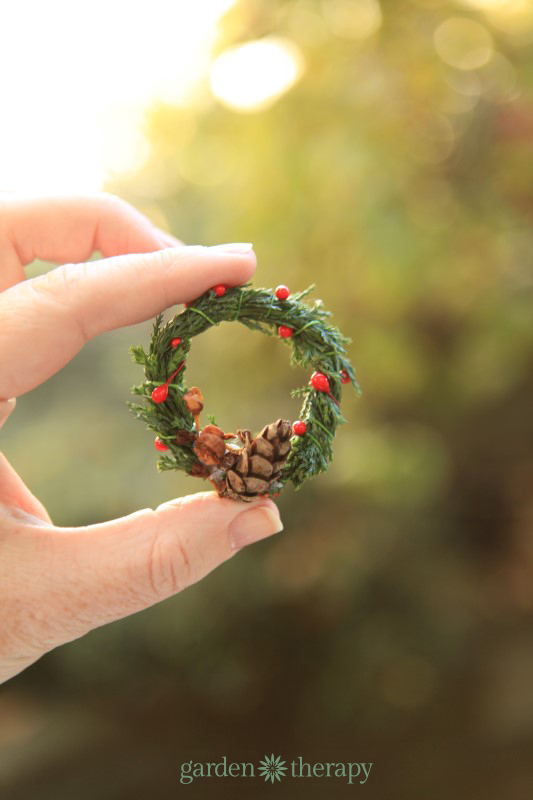 I love the miniature wreath being added to a gift. Thanks for another lovely idea. I downloaded the app, but so far didn’t get a message about entering the draw. Hi Linda, the entry comes in as an on app message. You will see a yellow dot on bottom navigation. TAP messages to open. TAP to enter. Let me know if it works for you! Those are absolutely darling Stephanie!! These are too cute! There are so many possibilities…napkin rings, place cards…love them! THis is adorable! 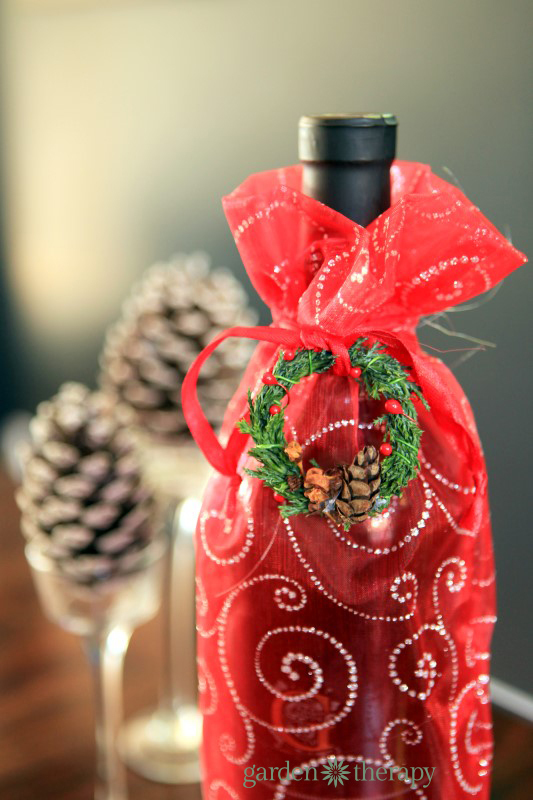 I love how you showed us how you can decorate a hostess gift wine bottle with it!